Celebrate the end of tax season with some of these awesome freebies and deals! Source: Great American Cookie Co.
Great American Cookie Company- Free regular sugar cookie on April 15, 2015. No purchase necessary. One per customer. Burger King- Use this coupon for a buy one Whooper, get one free Whooper. Qdoba- Buy one Bacon Jalapeno Queso Burrito, get one Bacon Jalapeno Queso Burrito free. Say "Mid Week Buddy Pass" at the register. Schlotzsky's- Free small original sandwich with purchase of 32 ounce drink and a bag of chips. Boston Market- Buy one meal, get one free on April 15, 2015. Hooters- Take the IRS (I'm Really Starving) pledge and enjoy all-you-can eat wings all day on April 15, 2015. Prices vary by location. Dine in only. Hard Rock Cafe- If you 'Sing for your Supper' with the Hard Rock band on April 15, 2015 you could earn a free meal. Chilis- Free appitizer or dessert with coupon through April 16, 2015. Office Depot- 2 free pounds of shredding with coupon. Staples- 5 pounds of free shredding with coupon. 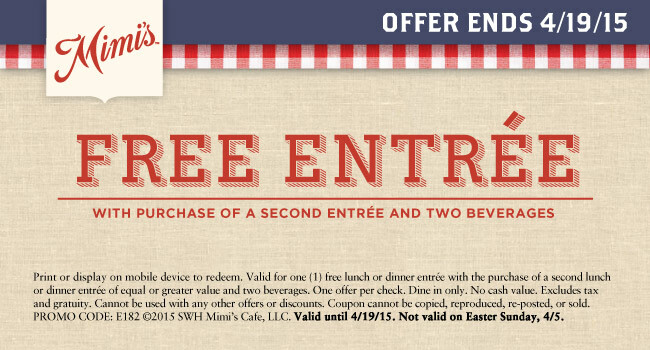 Mimi's Cafe- Free meal with purchase of meal and 2 drinks with coupon. Orange Leaf Frozen Yogurt- Fill your cup for $4.15 on April 15, 2015. Make sure to go to their Facebook page to get the offer. Must show proof through smart phone or printed confirmation. White Castle- 15% off your total order April 13- April 15, 2015. Print coupon or show it on your phone. Sonic- Half price cheeseburgers all day on April 15, 2015. Papa Johns- Enter promocode taxcut to get 40% off one regular priced pizza through April 16, 2015. Or order a large 5 topping pizza for $10.40. Beef O'Brady's- 15% off your purchase on April 15, 2015. Bonefish Grill- Follow the link to get $10 off your visit through April 20, 2015. Buca Di Beppo- 15% off with coupon through April 19, 2015. Outback- 15% off with coupon through April 19, 2015. 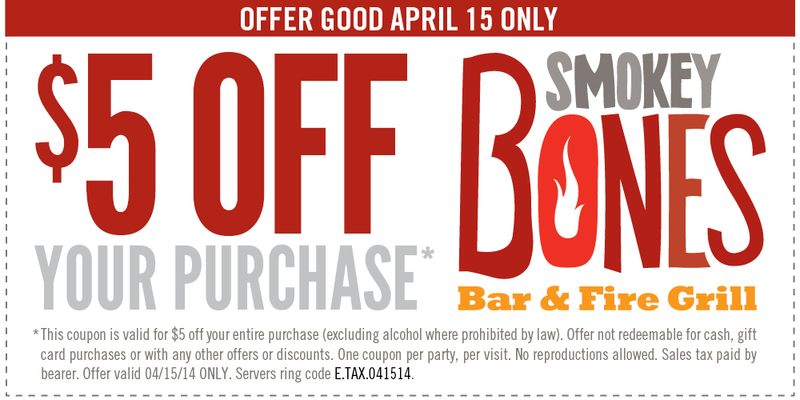 Smokey Bones- $5 off your purchase with coupon on April 15, 2015. Pizza Hut- Enter their "National Pizza Return" contest from April 13-April 18 for a chance to win Pizza Hut gift cards. Smokey Bones- Play the Tax Day scratch off game. Everyone wins!